While all eyes were recently on Churchill Downs in Louisville, Ky., as Justify trained up for his bid for the Triple Crown, one man was been busy making headlines for himself 100 miles North of the Twin Spires. Santo Sanjur, a native of Panama City, Panama, has taken the Indiana Grand jockey colony by storm in his first year riding in the Hoosier state. Although the track’s meet started only 37 days ago, Sanjur has picked up 108 mounts so far, and has already 22 wins under his belt. This ties him for Indiana Grand leading rider standings by wins ahead of local veterans such as Rodney Prescott and Marcelino Pedroza. What’s more? This is only the 22-year-old’s fifth year riding competitively. With an in-the-money percentage of 53% this meet, many have taken notice of the new kid with those numbers. Others have taken notice of Sanjur for another reason: his name. While officially taking the last name “Sanjur,” Santo is no stranger to having family in the racing business. Indiana racing natives will recognize the name of Sanjur’s cousin, Juan Saez, a rider who was killed tragically in an accident at Indiana Grand in October of 2014. Though he was on a path nearly identical to that of Santo, Juan is not the young rider’s best known relative. His most famous cousin is Luis Saez, pilot of horses such as Will Take Charge, Gunnevera and, more recently, Arkansas Derby winner Magnum Moon. Just like his two well-recognized cousins, Sanjur also attended Panama City’s famed Laffit Pincay Jockey School. It was a perfect fit. According to the school motto, it is directly in the heart of “the cradle of the best jockeys in the world.” During his two years at a school he considers to be “one of the best,” Sanjur said he learned the basics of being a successful jockey, though it was his desire for more that brought him to the United States. “I had always wanted to come and ride here and make my family proud,” Sanjur said. With his record so far, he is doing just that. Despite being new to Indiana, Sanjur is by no means new to racing in the Midwest. He spent the first four years of his American riding career at Arlington Park in the suburbs of Chicago, where he had much of the same impact as he has had at Indiana Grand. From May of 2017 to September of the same year, Sanjur rode 452 horses and picked up 57 wins that totaled almost $1.5 million in purse money. He finished second that year in the Arlington jockey standings. The impression those four years in Illinois gave him carried over across the border to Indiana, where horsemen of all types cannot get enough of him. Michelle Elliott, trainer and daughter of the well-known Indiana breeder Jim Elliott, is one of them. 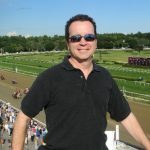 Where he continues to experience days where he rides three or even four winners on the same card, it is easy to see why Sanjur continues to make news in the Midwest. Though he doesn’t see himself moving out of the Hoosier state anytime soon, Sanjur does have a few races in mind that he would really love to win more than anything: the Kentucky Derby and a Breeders’ Cup race. And if his current success is any indicator, it won’t be long before we see Sanjur on a bigger stage.